It feels as if we’ve waited so long for it, but last weekend, it was hot! A searing, burning sun carrying bright sparkling light shone upon us all here in Western Europe. 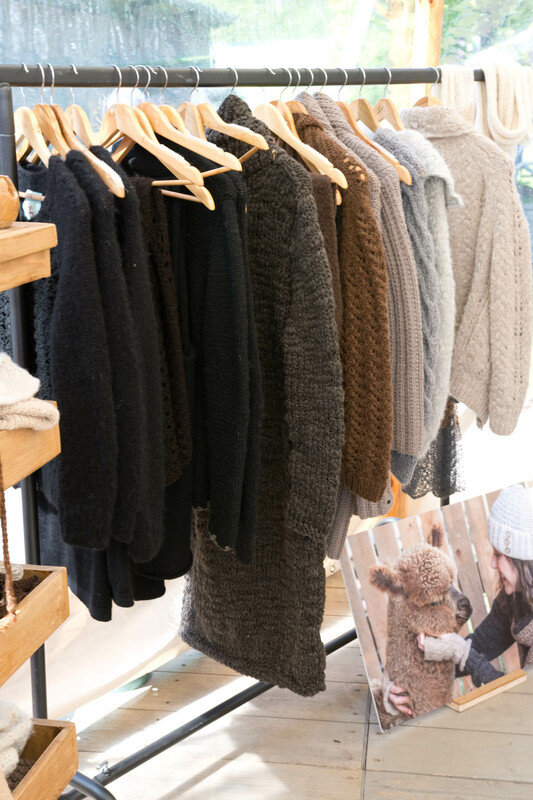 Happily, it also marked the weekend of the greatly anticipated Beervelde Garden Days, an utterly magnificent bi-annual outdoor garden and lifestyle event held in May and October. The sun, heat and very merry public made it all the more sublime. The Beervelde Garden Days are held in privately owned Beervelde Parc, located 18 kilometers East of Gent, Belgium. The event is impeccably curated and hosted by Count Renaud and Countess Valérie de Kerchove de Denterghem who open their home, for three wonderful days. 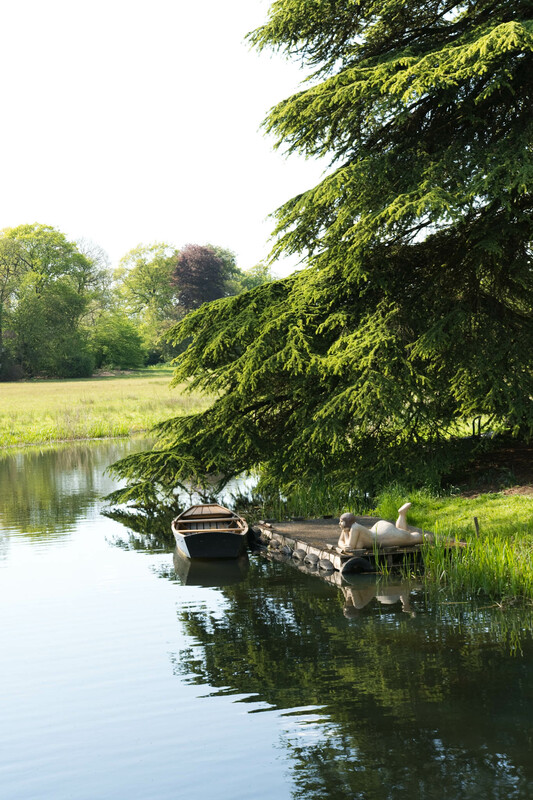 Beervelde Parc is 25 glorious hectares of woodland, expansive lush meadows, flower gardens and a grand lake fed by a river. During the fair you are free to roam the grounds, with all of the buildings, including the ground floor of the stately villa and the coach house, being used by merchants. This Spring there were more than 220 specialist growers, producers, makers and manufacturers with an incredibly diverse array of superb quality produce and crafted product. We enjoyed browsing all of the plant and flower stalls, my favourites are always the peony and bulb growers. I’ve never seen so many different varieties of Iris. 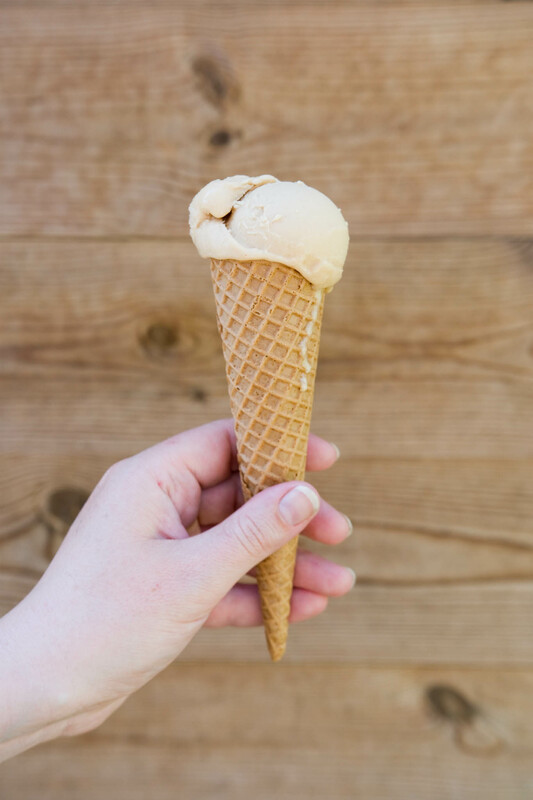 We also tasted many new things, the standout being a beautiful ice cream made from horse milk. Incredibly light and smooth and full of flavour. It was a very pleasant surprise. The coach house is a complex of buildings that surround a courtyard with a large fountain. The buildings are made of red brick with subtle architectural details and have a very healthy vine sprawling across the facade. The stables have beautiful original wooden doors and a stone floor where a couple of antique dealers and a jewellery maker were installed. They were surprisingly intimate rooms and had a lovely feel. 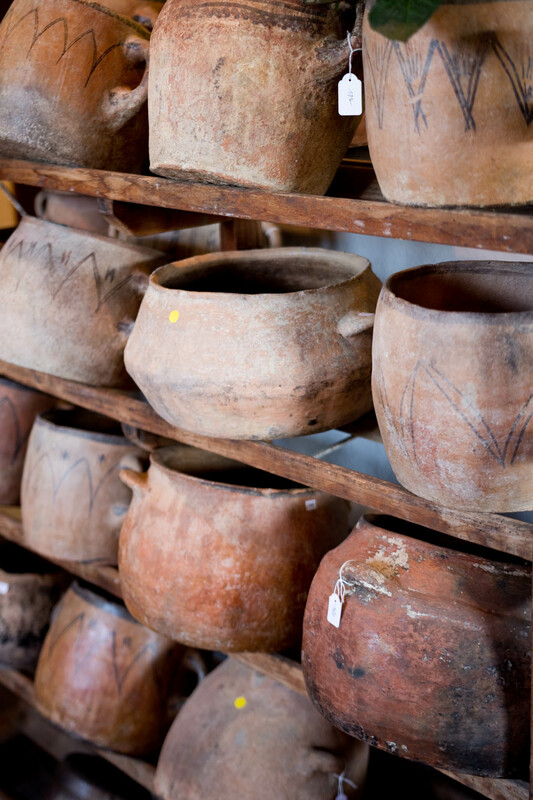 Here you will also find the barn and schoolhouse where antique dealer Anniek De Vlieger was selling exquisite antique earthenware vessels from Morroco originally used for storing water, oil and grain; large black marble plates from India and various other pots, bowls and planters from ancient Asia. 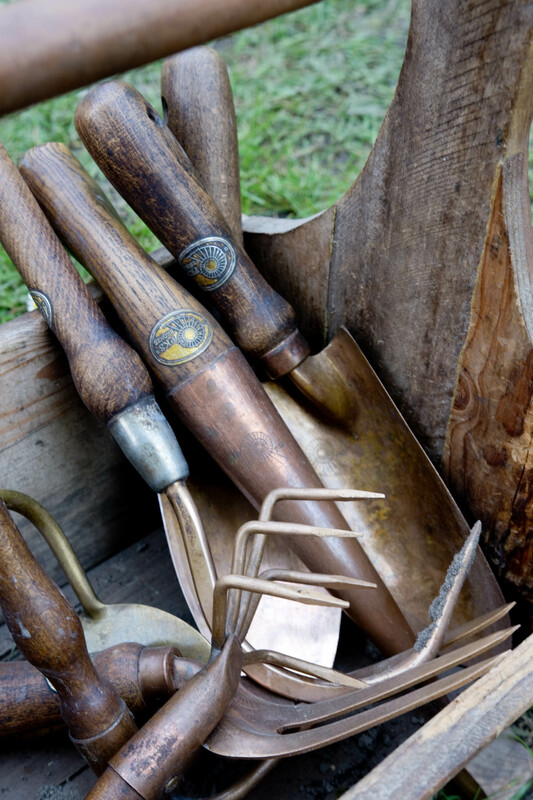 Another happy find, nestled in the arched entryway to the coach house was Kopersporen, sellers of beautiful bronze garden tools made by PKS BRONZE of Austria. Shiny and new they are just lovely but their aged patina and wooden handles are really what makes them beautiful. The tools they had for testing were delightful and so very well made. I bought myself a rose from Casteels Rozen. 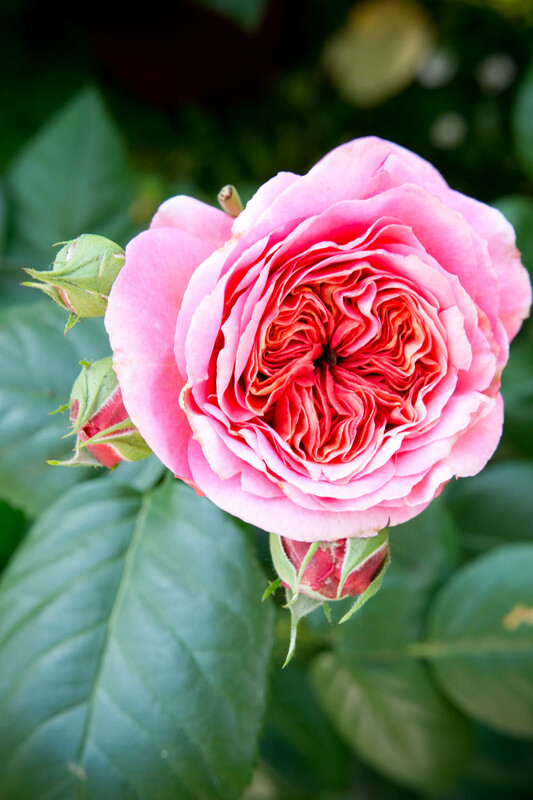 I am partial to double roses and this cupped, double rose called ‘Mary Ann’ is impressive in colour and petal count with a strong, delightfully sweet scent. We also had the pleasure of meeting artist Christophe Annys. He works primarily with stone but also plaster and molding. I think his stone sculptures are wonderful. Textured, gritty and evocative. 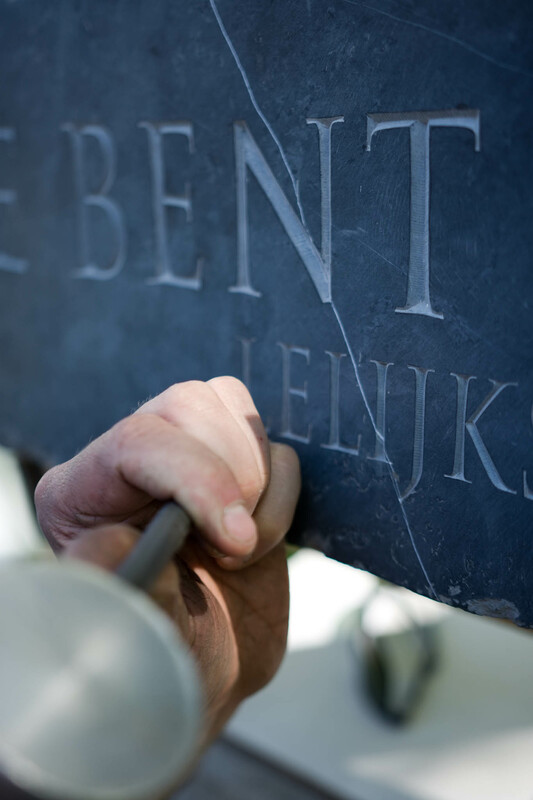 On this day however, he was demonstrating his skill in stone letter carving which he does under the business name Letterbeeld. His work is exact with no room for error. I loved that as I moved my way around the garden I could still hear his chisel sounding chink, chink, chink. At the end of walled vegetable garden were Wenceslaus Mertens and Hilbrand De Vuyst from Reizend Bakhuis who make wood fired ovens. 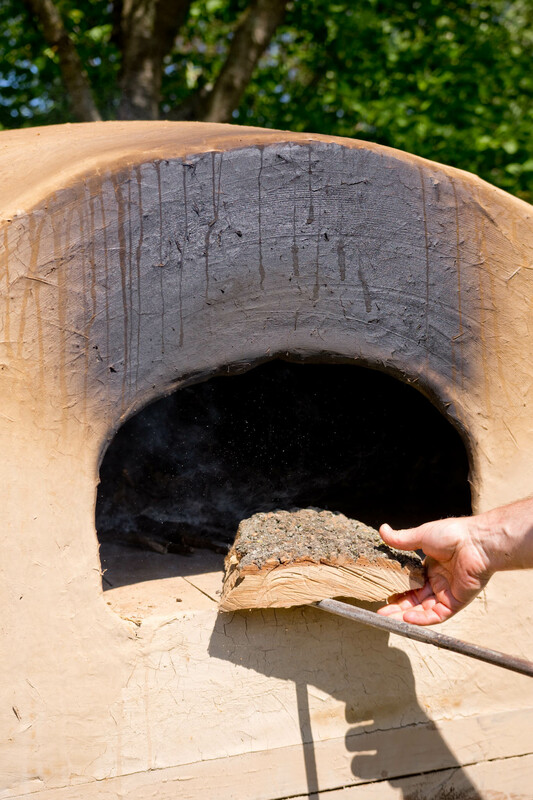 The two friends build their ovens using hand made bricks, clay, straw and tree branches. They use an exceptionally clever traditional technique of forming a skeleton made from woven tree branches that allow the oven to expand and contract during heating and cooling. We had a lovely long conversation about how the ovens were constructed and built to last and last. What astounded me was that they often build the oven inside a stand alone building designed as a bake house where all bread preparation, proofing and baking occurs. 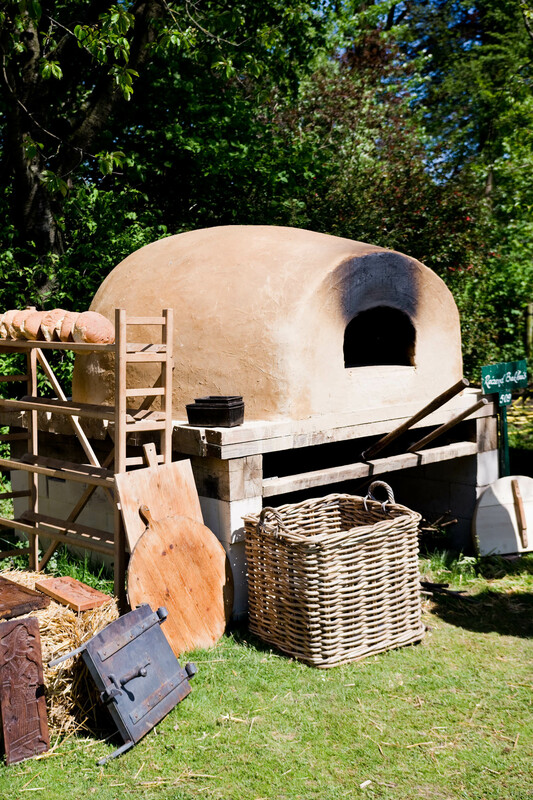 The installation of such a bake house constitutes a serious investment in wood fired baking and families do so as a multi-generational investment. Reizend Bakhuis reflect this attitude and ideal by providing a three generation warranty on their ovens. I was so glad to hear that this way of living and cooking is alive and well in Europe. 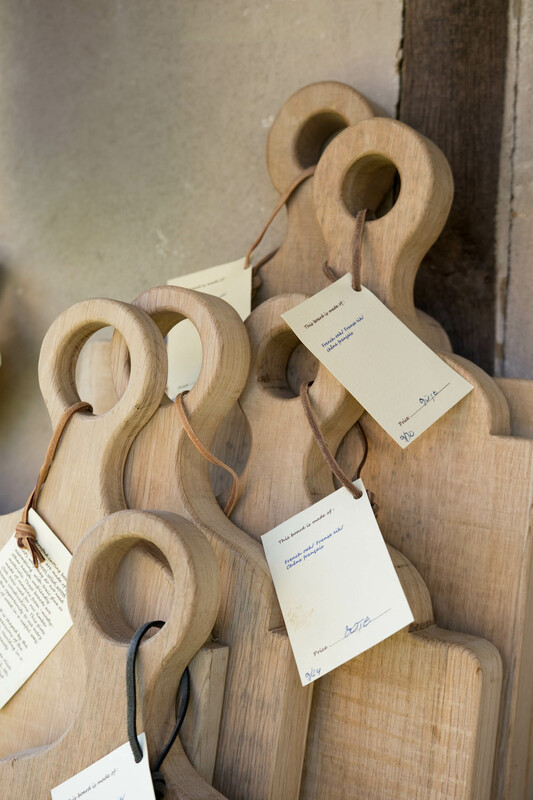 With his wares spread out over three enormous tables, and a view of the villa across a splendid meadow, we met Dirk Mortier and his wooden boards. 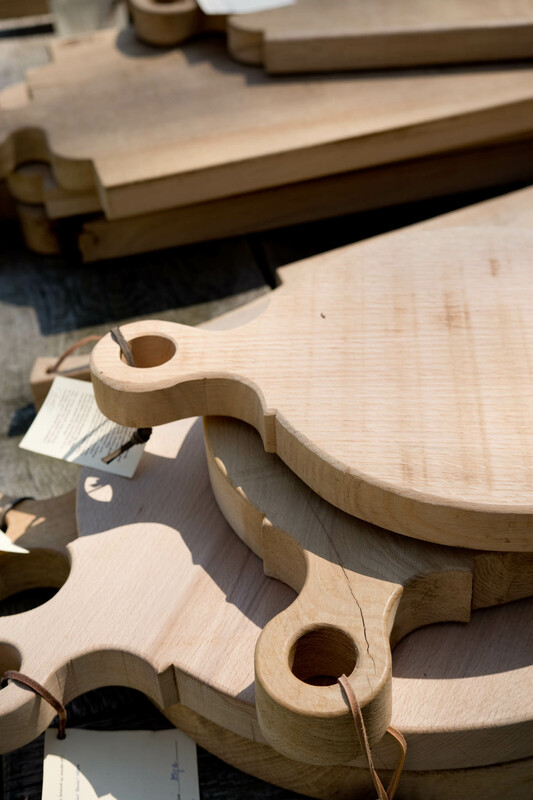 Spectacular, solid, working chopping or cheese boards. 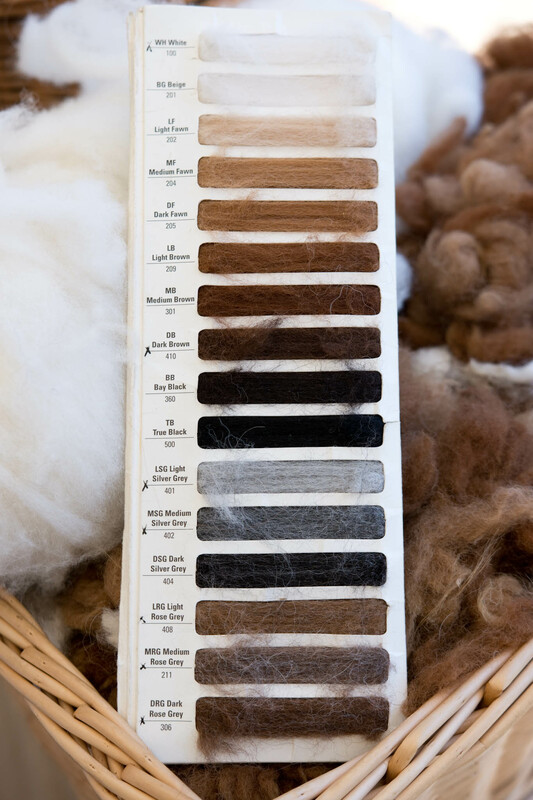 At around 5cm or 2 inches thick, they appear built to withstand warping and hard work. He uses a range of wood types including French oak, American oak, European beech, European ash, plum and walnut and are made by himself, one by one, in his atelier in Belgium. You can see by the images above that these are boards with gravitas! He has a wonderful sense of celebration and feast with oversized styles that would require at least two people to carry when laden with gorgeous food. I can imagine a wonderful, characteristic grazing table at a family feast utilising different sizes, layered in levels creating a dramatic presentation. Amongst the peony and rose sellers were master basket weavers Philippe Guérinel from France and Bruno Vloeberghs from Belgium. Both are masters in different weaving techniques and they gave us a wonderful tutorial in how their basket weaving styles differ. 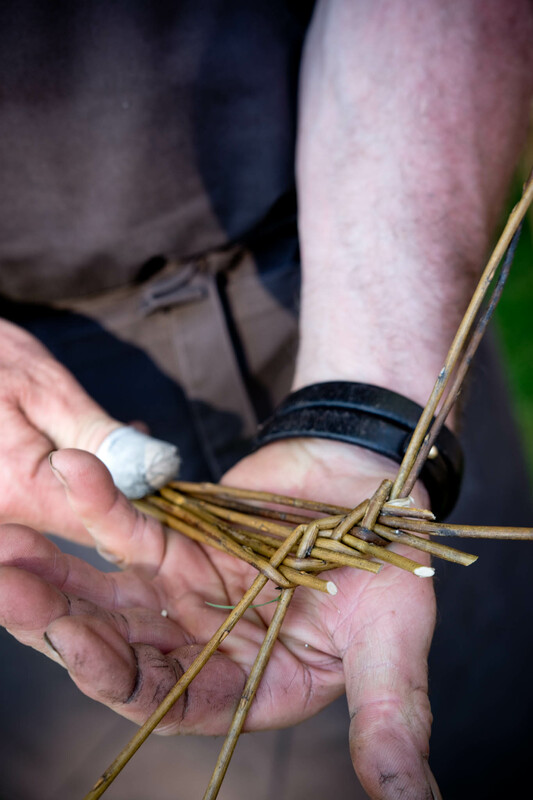 Philippe Guérinel forms baskets using an artful technique known as Périgord, from the Dordogne region of France. 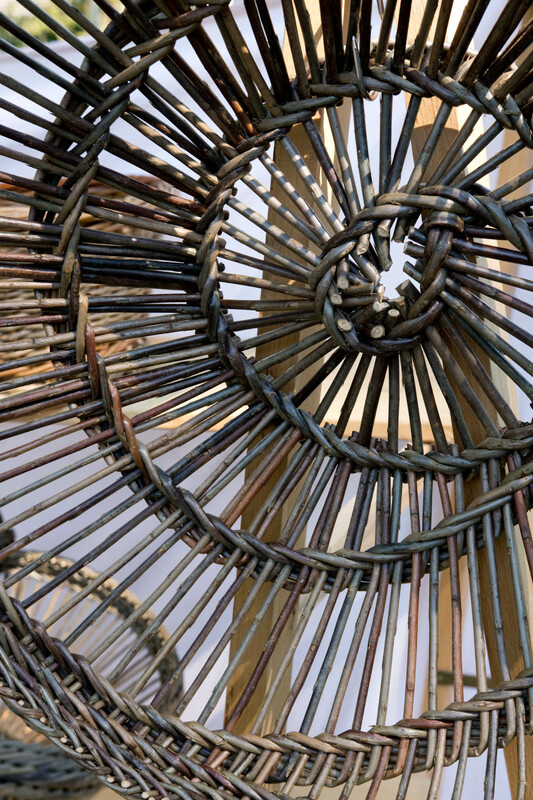 The basket is woven free form in a spiral structure which produces a very light but very strong basket. It appears from the range of baskets he had on display that the possibilities for shape are vast. He is able to form very flat, open, plate like baskets but also very curved and deep forms. I was captivated. They truly are beautiful objects. It takes great skill to produce a result such as this, a skill developed through a life-time of dedication and practice. You can see more of his baskets here. All in all, we had a wonderful time at the Spring Beervelde Garden Days. The thing that stood out to me most of all was the overwhelming, majestic passion that all of the makers and producers had. They truly love what they do and enjoy expressing that through conversation. Great skill, knowledge and know how was demonstrated at every stall and tent and quality was evident throughout. It was a highly pleasurable weekend and I look forward to the Autumn event.